INMED’s Healthy Children, Healthy Futures program has improved the lives of millions of children in Brazil. In partnership with the Engie Foundation, General Mills and United Way Worldwide, the program develops and delivers participatory education in preventive health and nutrition, as well as treatment of children with intestinal parasitic infection. In regions that lack public sanitation and clean drinking water, our team at INMED Brasil teaches families how to perform solar water disinfection (SODIS) by filling recycled clear plastic bottles and leaving them in the sun for 6 hours. This safe and simple disinfection method has been proven to kill viruses, bacteria and parasites and is effective even in low temperatures. 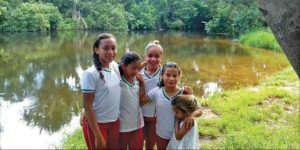 In addition to helping families produce clean drinking water, INMED Brasil is partnering with corporations, nonprofit groups and municipalities to protect water resources. INMED’s clean-up and education efforts have improved the quality of 1.350 water sources serving more than 1,500 families. Learn more about this program and other great work INMED Brasil is doing by visiting https://inmed.org.br and follow @INMEDBrasil on Facebook.